You get a delivery of locally grown fruits and vegetables, and your school gets four dollars. Call it food for thought. 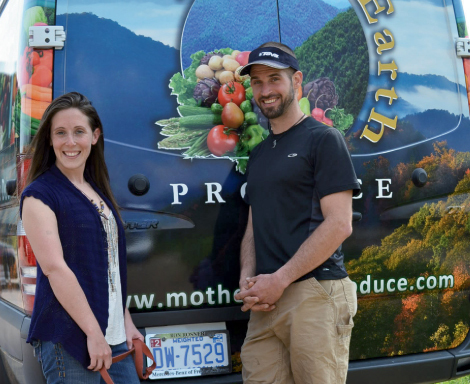 Andrea and Graham DuVall, founders of Mother Earth Produce, deliver fresh fruits and vegetables to Western North Carolina homes, turning their van into a farm-to-table service. The company, which started up earlier this year, partners with more than 25 area farms, including Balsam Gardens and New Sprout Organic Farm, to ensure their clients receive organic crops year-round. Now, the entrepreneurs have launched a philanthropic venture that substitutes veggies for candy bars, magazine subscriptions, or other typical enticements schools offer through fund-raising efforts. Here’s how it works. A school signs up with Mother Earth’s SOS (Supporting Our Schools) program, and is assigned a code number. When parents, teachers, and local boosters order a bin and mention the code, the school earns four dollars. So far, three schools in Asheville have signed up: Valley Springs Middle, Johnston elementary, and Rainbow Mountain. The bins filled with seasonal fruits and veggies come in three sizes, ranging in weight from about eight to 16 pounds and cost between $26 and $49.50. A recent delivery consisted of romaine lettuce, cherry tomatoes, edamame, mixed bell peppers, green beans, sweet potatoes, Delicato squash, and red seedless grapes. Regular deliveries are handled every week but customers can pick a custom schedule, making it a convenient way to fuel up on healthy foods while supporting our schools.